With kindest regards to Bob Peak, who did the amazing poster for Apocalypse Now for its 1979 release. 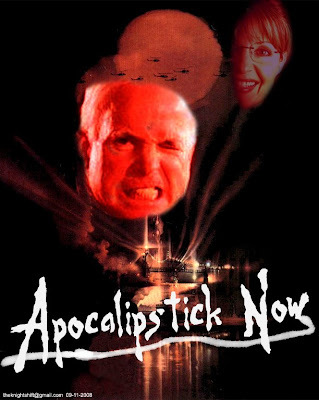 Wish I could have found a pic of McCain with water dripping down his face, to match the effect of the original poster. ROTFLMAO! Genius! How did you make the logo? There are some "Apocalypse Now" TrueType fonts floating around the Internet that you can download and install.